Using the Akatsuki spacecraft, Japanese scientists have detected a large, bow-shaped anomaly in the upper atmosphere of Venus. Strangely, the 6,200-mile-long structure is refusing to budge despite the 225 mile-per-hour winds that surround it. Researchers from the Japan Aerospace Exploration Agency’s Institute of Space and Astronautical Science believe the phenomenon is the largest stationary “gravity wave” ever recorded in the solar system. Emanating from the mountains below, the unusual weather phenomenon is strong enough to withstand ferocious background winds, causing an enormous bow-like structure to hang in the upper atmosphere like a gigantic scar. Venus, that cloud-covered hellhole of a planet next door, is rife with exceptionally strange atmospheric behavior. Winds in its upper atmosphere howl at 223 miles per hour (359 kilometers per hour), a speed that’s considerably faster than the slowly-rotating planet pictured below (a single Venusian day lasts longer than an entire Venusian year). Thick clouds of sulfuric acid move in a westerly direction on account of the entire upper atmosphere rotating significantly faster than the planet itself. In late 2015, JAXA’s Akatsuki orbiter—a spacecraft designed to investigate the atmospheric dynamics and cloud physics of Venus—made some strange observations over the course of several days. As described in a new studypublished in the journal Nature, the probe detected a stationary, bow-shaped structure in the upper Venusian atmosphere. A research team led by Rikkyo University astronomer Makoto Taguchi spotted the anomaly by analyzing images taken by Akatsuki in the middle infrared and ultraviolet spectrums. Parked 40 miles (65 km) above the scorched surface, the bright, unusually warm region stretched for 6,200 miles (10,000 km) across the top of Venus’ clouds (nearly the diameter of the entire planet). The structure did not move despite the background surrounding atmospheric winds, remaining stationary above a mountainous region of the planet’s surface. Prior to this observation, scientists observed a number of small-scale atmospheric features that moved either faster or slower than the prevailing winds. This gigantic streak, and its contempt for the winds around it, caught the JAXA scientists completely off guard. Several weeks after their initial observations, the bow had disappeared, so it’s not a permanent feature. The researchers are now anxiously waiting for its possible return. After ruling out possibilities like a thermal tide (these are similar to ocean tides, but highly unlikely given that Venus has no moon) or an instrumental error (Akatsuki is in tip-top shape), the JAXA researchers concluded that the anomaly is likely caused by a gravity wave. Not to be confused withgravitational waves, gravity waves happen where mediums, like a fluid or gas, fight for a state of equilibrium under the force of gravity. Or as Taguchi explained to Gizmodo, “it’s an oscillation of density, pressure, velocity or temperature that propagates in an atmosphere by a balance of buoyancy and gravity forces as a restoring force.” On Earth, gravity waves produce waves on the ocean and airflow over mountains. 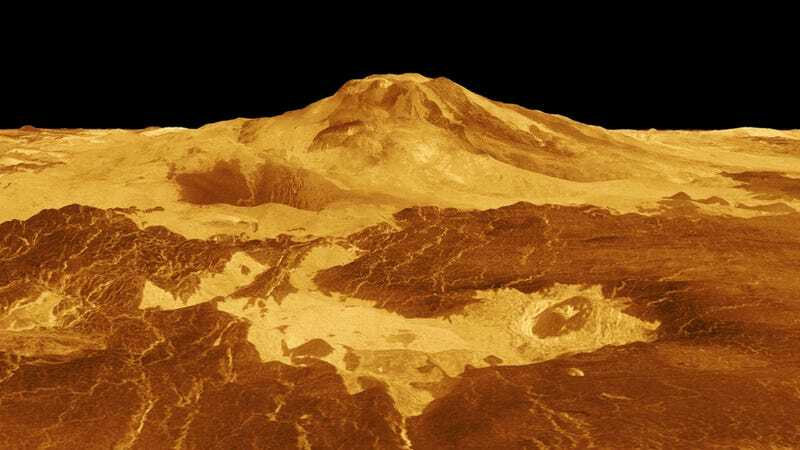 Scientists have observed small, transient gravity waves in Venus’s atmosphere before, a sign that mountain ranges are present below, but they’ve never seen anything quite like this one. On this scorched planet, gravity waves are generated near rugged, mountainous surface areas, and then drift upwards, lifting up into the sky and growing larger and larger in amplitude until they dissipate just below the cloud-tops. As the waves break in the upper atmosphere, they push back against fast-moving atmospheric winds with tremendous force, slowing those winds down. That’s the theory of how gravity waves typically work, at least, but this newly-observed anomaly suggests they also work on a near-planetary scale, affecting the cloud-tops for thousands of miles. Using computer models, the researchers verified that large, stationary gravity waves are indeed possible. “Our simulations of gravity wave propagation showed a similar pattern of temperature distribution at the cloud-top altitudes as the observed one,” Taguchi told Gizmodo. All this said, Taguchi’s team is not entirely certain if the gravity waves produced by the Venusian mountain ranges are capable of spreading upwards as far as the cloud-tops without a little help. 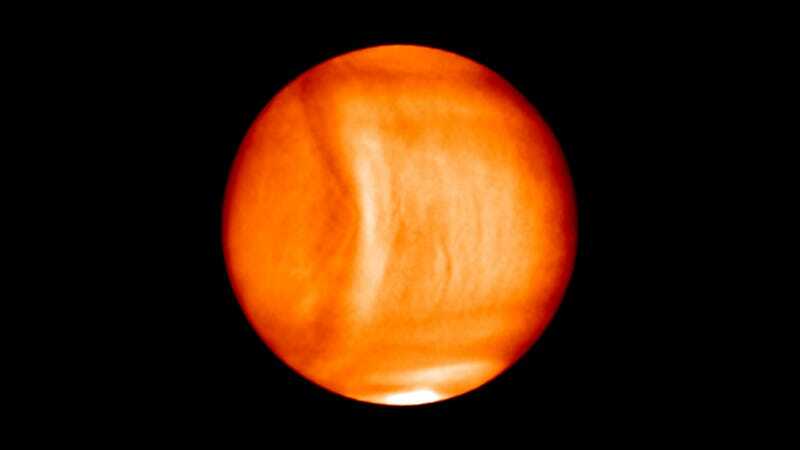 The researchers speculate that winds in the deep atmosphere may be more variable in space and time than previously assumed, boosting the ability of gravity waves to propagate to the upper portion of Venus’s atmosphere. Venus, as we’re learning, is a surprisingly complicated—and unusual—place.